Old friends moved from big detached house in Lee to smaller detached house in… Lee. After living for so many years in a big familiar house it must be a big wrench to move somewhere so different, even if it is just around the corner, and across the road and around another corner. Moral support was suggested, so we went along and lent a hand or two, and the sun shone. I like the new house, it’s very sure of itself, four-square and solid, and the road is quiet but close to the shops at Lee Green. The chunky Victorian pillar-box sets the tone of the road, “You won’t find a better box than me,” it seems to say. The garden was a pleasant surprise, tidy and mature. At the bottom of the garden was a tall old straggly greengage tree full of fruit, some of it oozing juice which glistened in the sun, and the ground around was covered with windfalls. The fruit tasted of my childhood, strange how some tastes and smells can transport you back to a distant moment almost a lifetime away. Mum always bought greengage jam in the cheap jars from Poland which were full of real fruit, more a compote than a jam but in those days no one had heard of a ‘compote’. I think we were the only house in the neighbourhood with green jam and I can still imagine the thick slices of white bread coated with butter and then piled with jam, always with a piece of the fruit in the middle. 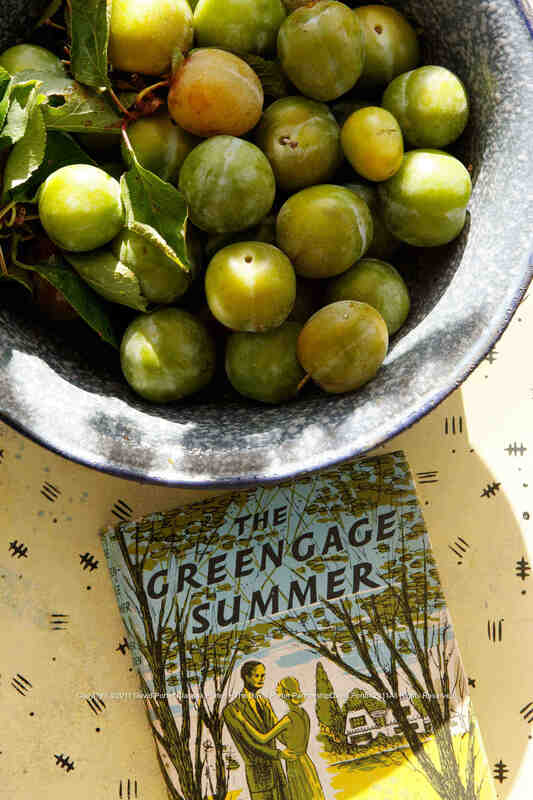 There are a few stories about the origin greengages in Britain, the best known is the story of Sir William Gage arranging for some fruit trees to be sent from France to his home in Suffolk in 1724. When they arrived the labels had been lost and the green fruit became known as the green Gage’s plum. Green plums were already here of course but they weren’t called greengages. When Henry VIII’s Mary Rose sank in the Solent in 1545 she was carrying five different varieties of plums including the green Reine Claude. 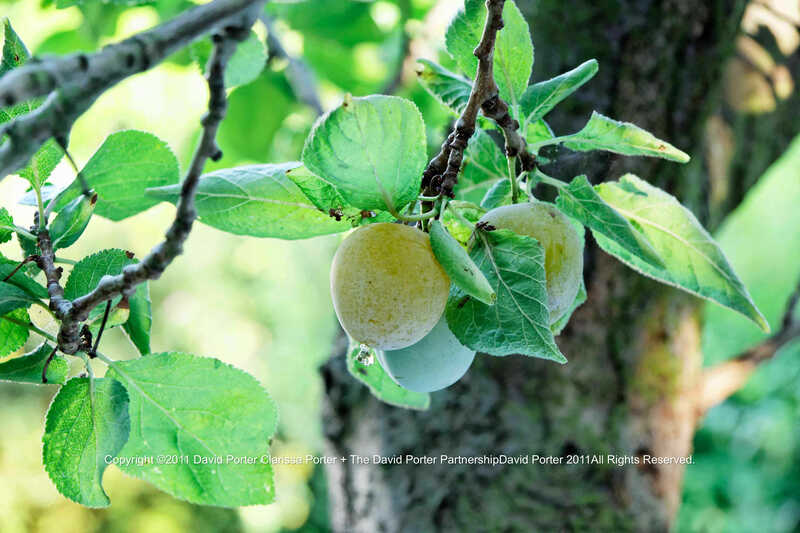 We are the only country to distinguish between gages and plums, but then most people have only heard of the Victoria plum, probably the least satisfying plum and vastly inferior to the greengage for flavour, ‘dangerously bland’ and ‘only good for canning’ said Jane Grigson. Not all greengages are green, some are purple and some are gold! Greengages were well-known in France where they are called Reine Claude after Queen Claude wife of Francis I. Married in 1514 aged 15 and dying at 24 after giving birth to seven children, Claude was also known as ‘Good Queen Claude’. The green plum from Italy arrived in France at Chateau de Blois, where Claude’s parents had constructed an Italianate garden filled with fruit trees. Queen Claude gave her trees to anyone that was interested, and to this day the area around Blois is crammed with greengage trees. While I was having my own personal reverie under the greengage tree the others were carrying boxes to and fro and pulling up the swirly carpet in the new house. Every so often I heard Clarissa telling anyone who stopped still long enough that “swirly carpet is very trendy at the moment…you should frame it and hang like a picture.” They seemed to be coping so I picked all the greengages I could reach, a bowl full, and showed them to my friends. “Yes, greengages aren’t they fantastic,” said the husband. “The man who sold us the house told me they were Victorias, but there must be something wrong with the tree because they never ripened just fell off still green and the foxes ate them.” He’d lived there 40 years. I took the greengages home promising to return the next day with a tart for the new house. 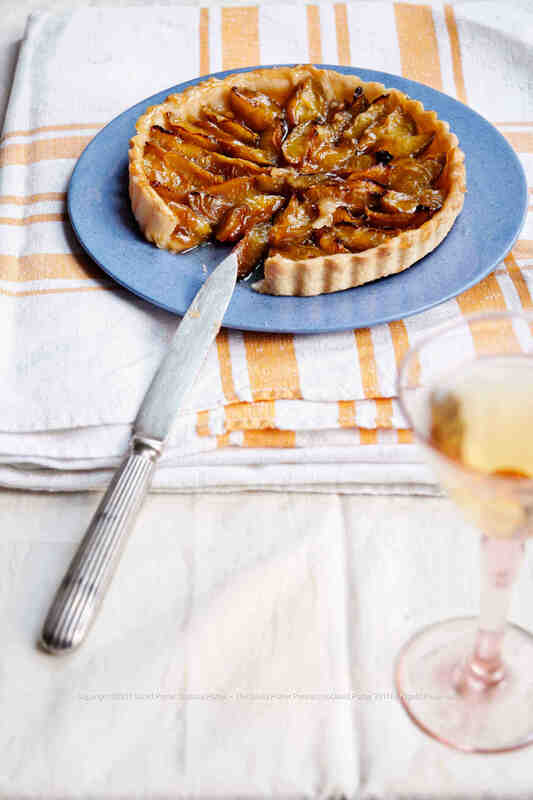 This is a recipe from Jane Grigson’s ‘Fruit Book’, and she copied the recipe from a pastry cook in Montoire about 25 miles from the Chateau at Blois. The recipe is easily adaptable to other fruit such as peaches, or several fruits mixed together. The pastry cook’s skill is to have the circles of fruit glisten and shine but at the same time prevent the pastry base becoming soggy. The trick is to use a plain shortcrust pastry and either save some of the crumb-like pastry before its rolled-out, or, when you’ve prepared the tart case take the bits of pastry you’ve trimmed off and chop them into even crumb-sized bits and then scatter them across the pastry base. I had about 1.5 kg (approx. 3 lb) of greengages, which made 3 tarts of differing sizes. Into a big mixing bowl sift the flour, sugar, and salt. Add the chopped butter then gently rub them together with your fingers till the mixture resembles crumbs. Save a little of this for your tart base, perhaps 2 tablespoons. Now add a little ice-cold water and stir it into the crumbs with a knife drawing the mixture together. Keep adding water little by little and stirring till you have a ball of smooth pastry dough. Very lightly dust this with flour and then wrap in clingfilm or greaseproof and chill for 30 minutes or even overnight. Grease and dust your tart or flan tins, loose-ringed tins are best. I’ve used 3 different sizes because that’s what I have, the smallest about 12 cm diameter, then one about 17 cm and the biggest about 20 cm. On a cold floured surface roll out the pastry, try to keep it as even as possible, and turn it to roll it in a different direction. Don’t over work it. Lay it in your tin and gently press down from the centre then out to the sides where it’ll flop over the edge. Run the roller across the tin to trim the excess, and chill again for 30 minutes. Now scatter the reserved pastry crumbs, or the chopped trimmings across the base of the pastry. Any dough leftover can be frozen for future use. Now you’re ready to prepare the greengages: I used a sharp filleting knife to score all the way around each fruit from top to bottom, then gently separate the two halves with a twisting motion. Remove the stone and slice each half into 4 slices. Make tight concentric circles of fruit, skin side down, starting from the centre and out to the edge. When the case is full, place on a baking sheet and bake in the oven heated to 200C (400F) for about 25 minutes till the pastry is crisp and the tips of the fruit are just a little burnt. If the pastry looks as if it is burning protect it with strips of foil. Then remove and cool on a rack still in the tin. I think they should be glazed while they are still warm with a little melted apricot jam, or 2 tbs of sugar dissolved in a little warm water to make a thick syrup. When they’ve cooled remove from the tins and serve!